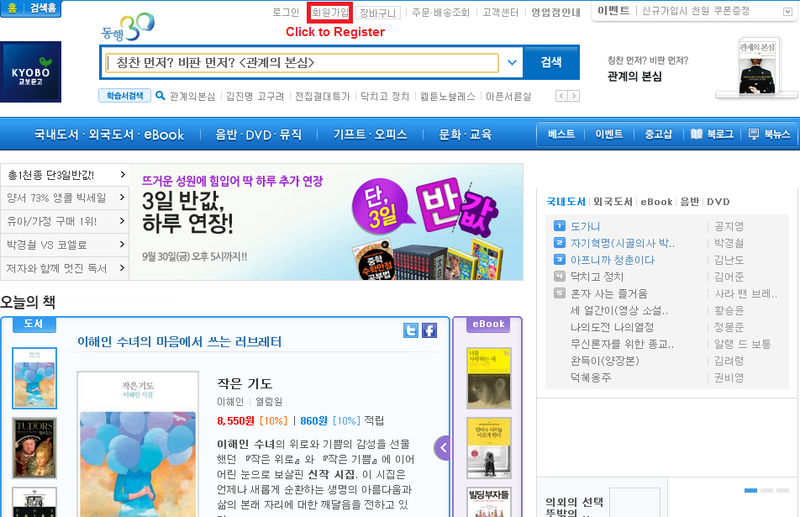 KyoboBook is a site where Hanteo gets information on sales from. 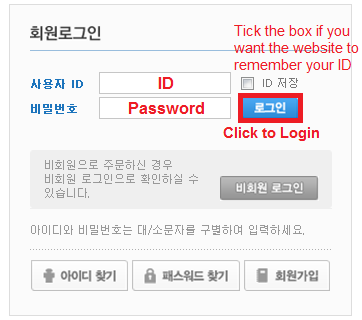 In other words, it can help SNSD in Music Bank, Inkigayo, GDA, SMA etc. 3. 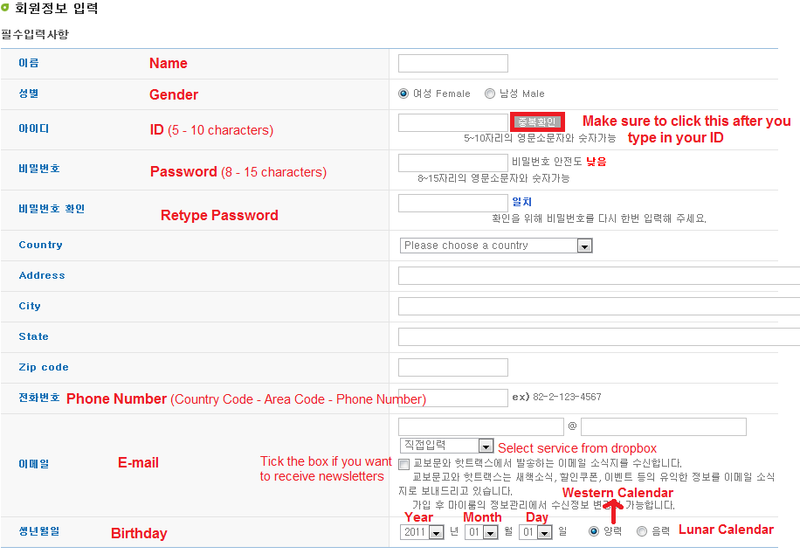 Select 4th button for foreign registration. 4. Scroll down and tick/select boxes/options. Click blue button at the bottom to continue. 5. Fill in your details. Click the blue button at the bottom to continue. You are now done with registering. 2. Type in ID and Password. Click blue button on the right to continue. Once you’re logged in, you can now start to order. 2. If you clicked the dark blue button, continued shopping for more items and you want to go to your cart now, click the second button from the left among the options on the top. 3. At your cart, you can check the products you want to order and confirm by clicking the blue button on the left to continue. 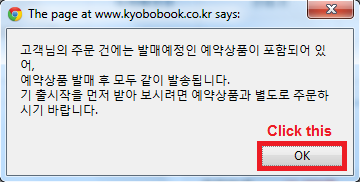 If this window appears, just click ‘OK’. 4. Time to fill in your address details. Scroll down and fill in your payment details. A new window will open when you click the red box. From the drop-box, select the second option. 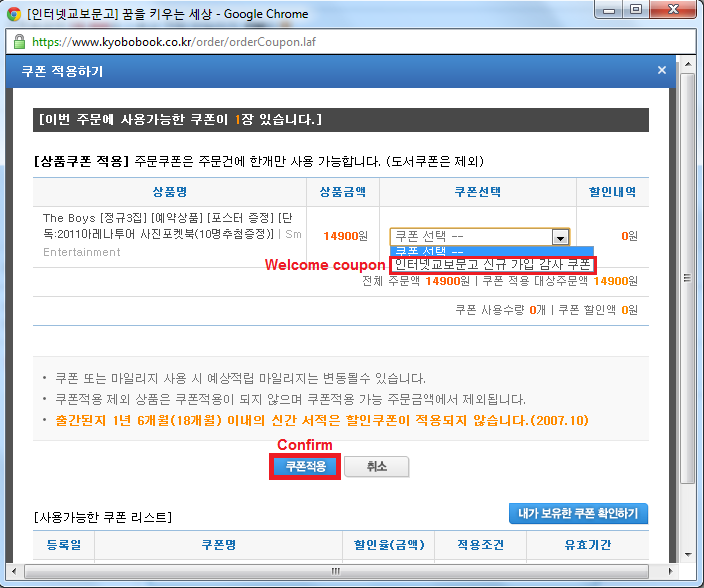 Click the blue button in the middle of the window to apply coupon. 5. 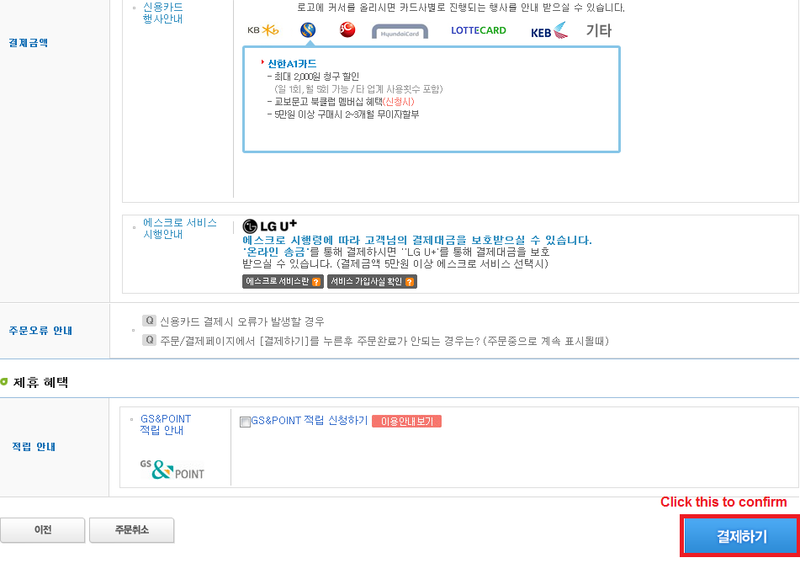 Scroll down and confirm your payment by clicking the blue button on the bottom right. How about if we want to purchase poster? will it comes with poster? this accpet paypal or not? 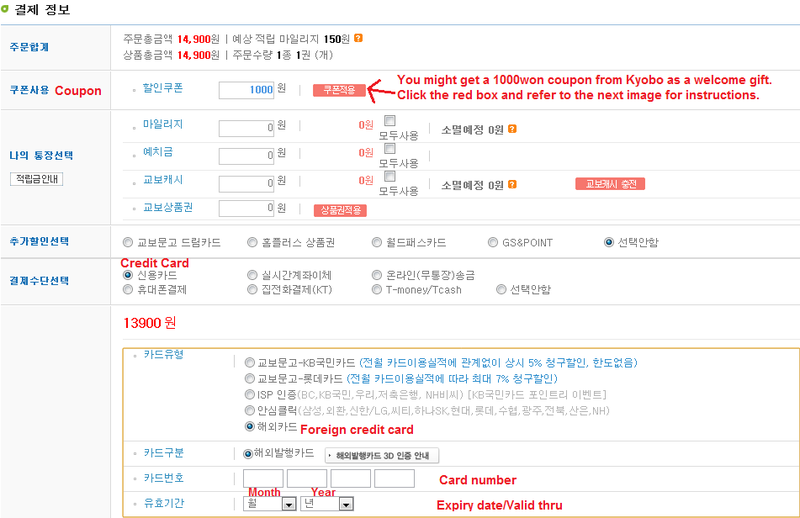 Have other korea web that accept paypal?? Would like to check if the shipping charges stated there (eg. 2000 won) is the final shipping price? No. If I’m not wrong, Kyobobooks is similar to Gmarket where the sellers have to deliver the items to Kyobobooks’ warehouse. 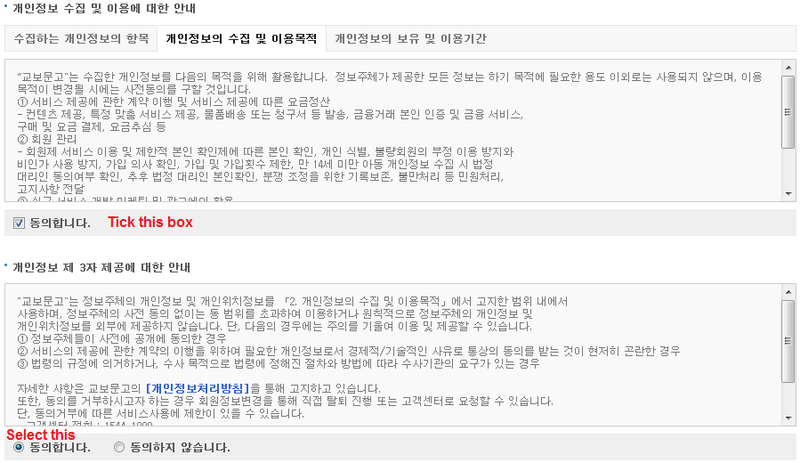 This delivery cost is 2000won, whereas Gmarket’s delivery cost is 2500won. 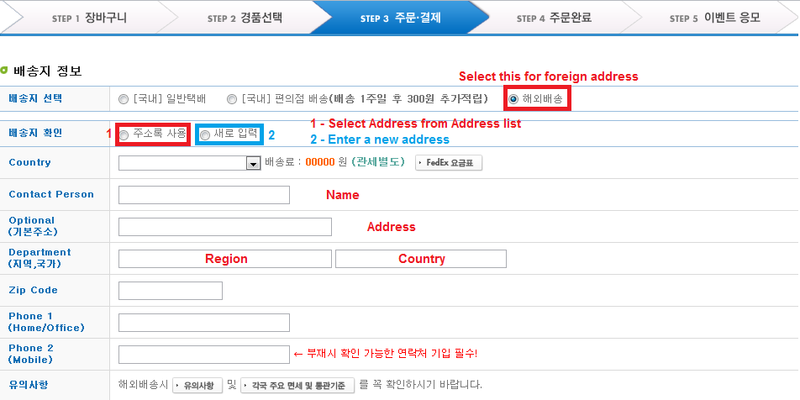 The overseas shipping price is stated next to the ‘Country’ box in step 4 of ‘How to Order’. See the ‘00000’ in orange? If you choose your country, it will automatically change to the shipping cost.